Constipation can make you feel uncomfortable, bloated and tired. Changing your diet is the best way to deal with it, but if you're looking for a quick fix that isn't harsh like laxatives, supplementing with vinegar is one option. Be warned, however, that vinegar is highly acidic and not suited for everyone. Also, no research has been done to show the benefits of vinegar for constipation. Consult with your doctor before you decide to take vinegar for your constipation. Constipation occurs when you have fewer than three bowel movements a week. Usually, these bowel movements are hard, dry and small. They can be painful to pass and require straining. Dealing with constipation often can lead to hemorrhoids. Typical symptoms include abdominal pain and bloating, gas and feeling like you haven't evacuated your bowels completely after a bowel movement. 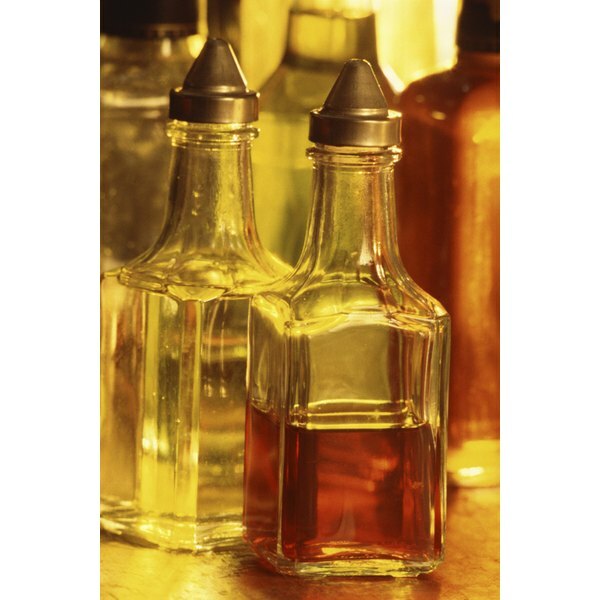 Vinegar contains many nutrients that are good for you and that may help with digestion. According to The Vinegar Institute, vinegar contains acetic acid, potassium, iron and pectin. Acetic acid is the primary ingredient thought to provide nutritional benefit for conditions ranging from high cholesterol to blood sugar regulation, according to Medscape General Medicine. The standard constipation remedy is outlined by Cal Orey in her book, "The Healing Powers of Vinegar." In the book, Orey suggests drinking 1 cup of warm water with 2 tbsp. of apple cider vinegar mixed in to bulk up stool and make it easier to pass. This is due to the vinegar's pectin content, according to Orey. Vinegar has shown to have some medical benefits, but there is no research backing up the constipation and vinegar connection. It carries many side effects that can be worse than the initial complaint. According to Medscape General Medicine, supplementing with vinegar could cause throat pain, stomach burning, tooth enamel erosion, heartburn and even ulcers.